Houston - We Have A Problem!Houston - We Have A Problem! The following headline and picture do a very good job of conveying the terrible impact of the storm for both left brained, quantitatively focused individuals and for the more visual and artistic right brainers. It also has something for Fed watchers as there’s a reference to the consequences being so severe that it would result in the Fed postponing hiking rates. I must add that this estimate is by far the highest I have seen so one should recognize it’s one person’s analysis and not the consensus. Nevertheless, the financial costs will be staggering. At CWS we are not just curious observers in terms of what is going on in Houston. We are knee deep into it, literally in some cases. We own 22 properties there comprising 6,647 units. We also have 152 employees in the Houston area. Three of our properties sustained first floor flooding which will require clean up, repair, and restoration. This equates to an estimated 180 units, or approximately 2.7% of our portfolio there. Overall we feel very fortunate in that it was possible it could have been much worse. We’re still not completely out of the woods yet in the event reservoir levels rise materially but so far the damage is relatively small from a portfolio perspective. 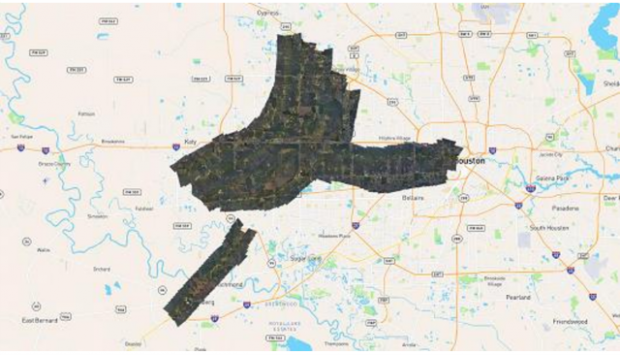 The following map shows how widespread the flooding has been in the Houston area. The White House estimates that 100,000 homes have been damaged in some form from Hurricane Harvey. One would have to imagine the vast majority of these are in the Houston area and I wouldn’t be surprised if the actual numbers end up being higher. 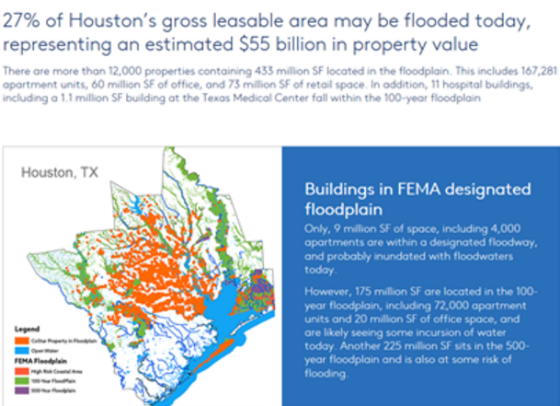 According to CoStar, a real estate research firm, based on the properties in the 100-year floodplain, its preliminary estimate is that approximately 27% of Houston’s gross leasable real estate area may be flooded. Included in this estimate are properties with approximately 167,000 apartment units. Of course not all of those would be flooded because many are on floors two and higher. That seems like a very high percentage of the apartment stock (nearly 20%), although in another article Better World Properties said that 40% of their units were damaged. If we assume that 10% of the apartment stock was damaged and there was an average vacancy rate of 8%, then just from displaced renters the entire apartment supply could be absorbed. And this is before factoring in 50,000 to 100,000 displaced homeowners (my estimate). We anticipate the demand for apartments to increase dramatically over the next 6 to 12 months. I think this will last awhile because many homeowners and apartment owners will be faced with standing water being present in their homes and units for a long period of time such that mold will be an issue and remediation work will have to be done. This is a regulated process in Texas so it has to be done to certain specifications. There will be huge pressure on labor, material, and equipment and the insurance infrastructure will be overwhelmed as well as property lenders that have to be brought into the fold also. Insurance can be very complicated. For example, at CWS we have a high aggregate amount of coverage for flood damage, inclusive of loss of rents, but a lower limit for mold. On the other hand, we have pollution coverage so we could file a different claim on that policy. We are spending countless hours working through the logistics of putting teams in place, housing them, and getting outside labor and materials to begin our repairs and restoration. We’re fortunate. We are a big owner in Houston, we have insurance coverage, and we also have a big project of 180 units to work on. While in aggregate Houston will have thousands of homes that need repair, the challenge is that almost all of them are owned by individual owners so they have to manage through the process individually with their insurance companies or FEMA or other aid organizations. I wonder what will happen to certain neighborhoods comprised of flooded homes if they have a significant number of residents without flood insurance. Will they get loans? Lender relief? Private help? Charitable contributions? If they walk away from their homes then lenders will foreclose and either fix them up, sell them to others who do, or maybe even end up demolishing them if mold becomes so pervasive and/or property values such that keeping the structure in place is uneconomical. It will be interesting to see if some of the big institutional single-family home rental companies step in to buy a lot of units in need of repair who end up renting them out to displaced homeowners and renters. In terms of how does this changes Houston in the future, a recent piece on Bloomberg echoes a lot of what I’ve been thinking regarding how Houston changes after this devastating event. 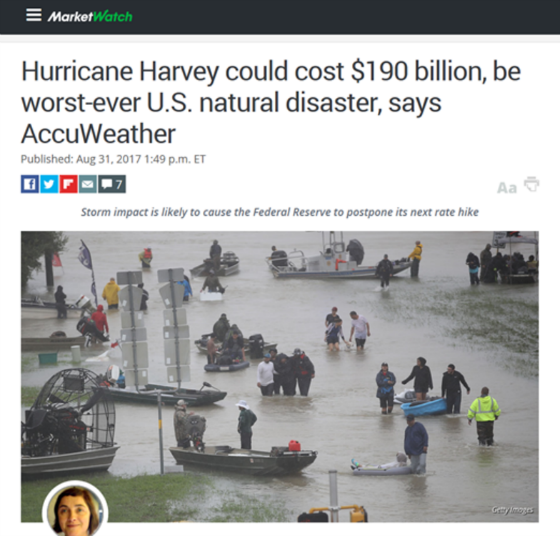 Will Harvey be to Houston what the great recession was to Wall Street, a crisis that permanently changes the economic model? Now that the nation is so starkly aware of flood dangers, will this be the end of cheap construction in areas at risk? Throughout American history, disasters have turned out to be catalysts in urban transformations. Think of Atlanta burning to the ground during the Civil War. The Great Chicago Fire of 1871. The 1906 San Francisco earthquake. 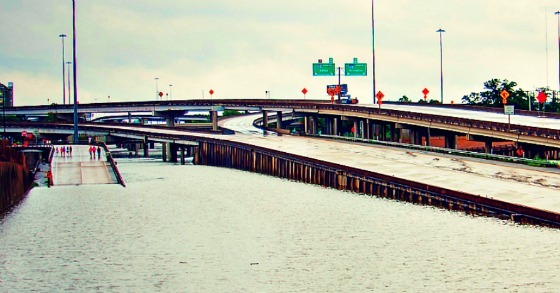 Harvey provides an opportunity for Houston to enact changes that might otherwise never occur. Hopefully, the vast majority of property that has suffered flood damage can get repaired as quickly as possible. But history suggests some percentage of properties won’t be worth salvaging, or their owners won’t be able to afford to salvage them. As they become vacant or sold, they create the possibility for redevelopment, perhaps large-scale redevelopment. By comparison, undeveloped lots in the exurbs may be seen as less attractive, both for investors and for potential transplants. If laws or norms change to take flood risk into account, that raises the cost of low-density development, making higher-density development relatively more attractive. Harvey could push Houston away from sprawl and toward a more sustainable density. Like the author, I too have been thinking that the suburban sprawl of Houston, which has helped give it the capacity to be one of the fastest growing major metropolitan areas, will now have to be rethought in light of what has happened and take ecology much more into consideration. The urbanization and densification of Houston may become much more of the norm in the future. My heart goes out to everyone whose lives have been turned upside down and please remember that it is always darkest before the dawn and that things will get better. Thank you for, not only keeping us informed in a timely manner (as always), but for a very complete and informative summary of the area and the forecast of the possible future results.